- I got scared, AGAIN, and prayed again. - I decided I was ready to do it, and applied some ORS mixed with castor oil so that my curls would stand out from the relaxed ends. - I waited for the curls to come, and then did my first snip ! - I ended up not being confident enough to wear my TWA out the house for the first 4 days. I wore my wig to work for the rest of that week. - The day after the Big Chop, I felt so good to be free of that relaxer !!! I didn't like the way my hair looked though. I felt like I looked like a man. Even though I was on Cloud 9 from the rush of the BC, the reality that my hair was gone set in. I didn't cry once over that hair, but I had alot of "now what??" moments. 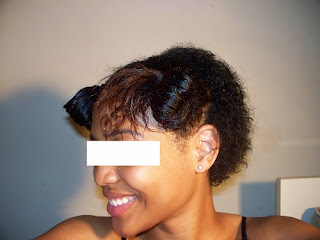 I thought about sew-ins or micros as a quick fix so that I wouldn't have to look at my hair... .....Cutting my hair off felt almost like a bad breakup.... After being in a bad relationship for so long, you feel empowered that you take the initiative to rid yourself of the stress, headaches, and drama !! At the same time, you are scared because it's a whole new world to you that you're no longer familiar with and you must take baby steps before you can "run" again. But things got much better after a few days !!! -Praise God that by day 4 I did a cowash with the conditioner method and I actually liked the way my hair looked. I felt more confident with my hair and started playing around in my makeup for the first time lol.. I ended up wearing my TWA out in public for the first time, and I actually felt GOOD about myself. -The next workday, my coworkers all said how much they liked my hair. That really made it alittle better, bc the men liked it as well as some of the ladies who have gorgeous relaxed hair and no intentions of going natural lol..
-The most outspoken girl in my class ( 3 years old) yelled out in a pitch quiet assembly room of about 100 students, "I LIKE YOUR HAIR MISS MICHELE !!! " I was slightly embarrassed that she called me out in front of everyone, but sooo flattered at the same time !! I'll be updating it every 2 weeks so I would love some other avid fotki ladies to add me as a friend so I can follow you ! It is becoming very addictive lol.. My username is ShelleyBean729 and the passwords are "runts" .. I would appreciate your comments !! I'll do a progress blog w/pics on here as well.. It won't be anything miraculous, but hopefully it will inspire others who want to transition or do their BC .. HHJ and thank you for reading everyone ! This is my favorite! It sounds exactly like my experience,I let my best friend cut it and I was praying the whole time,I love being natural but I wanted length...but once you start to see your curl pattern and snip off more of the permed ends it looks amazing. Your students are sooooooo adorable!!!! God bless you. Thank you IntellectandGrace !! I LOVE your username.. I'm glad your BC experience was wonderful as well. Thank you for mentioning my students ! I really miss that class, they were great =) God Bless Sis !! I remember this video on Youtube and the funny thing is that it was my inspiration to go natural. So i appreciate your honesty.